Researchers from ICSI, UC San Diego, University of Southern California, and UC Merced are building a system capable of understanding metaphors used in American English, Iranian Persian, Russian as spoken in Russia, and Mexican Spanish. The team includes computer scientists, linguists, psychologists, and cognitive scientists. Metaphors, such as Life is a Journey, describe one thing in terms of another: they’re mappings from a concrete source term (journey) to an abstract target term (life). Metaphors pervade language and affect, not just the way we speak about the world, but also the way we think about the world. The MetaNet Project will build a system able to extract linguistic manifestations of metaphor – expressions whose meaning relies on conceptual metaphors such as Life is a Journey – from texts in four languages and to understand them automatically. Using frame semantics among other tools, researchers will represent the relationships among metaphors and between expressions’ literal and metaphorical meanings as networks within a metaphor repository. The repository will allow users to browse, navigate, annotate, and modify these networks and will include links to linguistic manifestations. 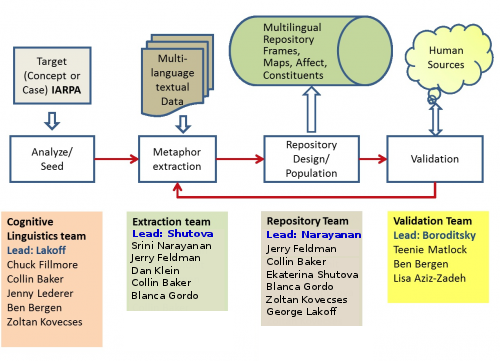 A system based on the repository will be able to extract and understand metaphors in texts through supervised and unsupervised machine learning. In conjunction, cognitive linguists and neuroscientists will test how metaphor affects thinking and emotion in order to evaluate the effectiveness of the metaphor repository and methodologies developed by the team. The project will provide information for an analysis of the role metaphor plays in how people from different cultural backgrounds make judgments and decisions. The MetaNet Project is supported by the Intelligence Advanced Research Projects Activity (IARPA) via Department of Defense US Army Research Laboratory contract number W911NF-12-C-0022. Disclaimer: The views and conclusions contained herein are those of the authors and should not be interpreted as necessarily representing the official policies or endorsements, either expressed or implied, of IARPA, DoD/ARL, or the U.S. Government.